Connolly’s of Leap is back in business. Sadly though, as Michael Caine would say; “Not a lot of people know that”. Hidden away beneath the hills of West Cork and no more than a stone’s throw from the picturesque Glandore harbour, Connolly’s has re-emerged as the jewel in the Cork music scenes’ crown. Whether it be standing on in the tiny dance floor or high above on the balcony, no viewing point is more than 40th feet away from the artist. It appears the reported 5 tonnes of sand that were packed into the stage for acoustic purposes have done the trick, as Connolly’s boasts to have some of the best acoustics in the country. 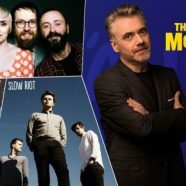 So, there was no better place for The Paul McLoone Show to host their first live broadcast outside of the big smoke and the line-up he selected was more than worthy of the distance travelled, as Cork’s own Jack O’Rourke was joined by Limerick’s up and coming, Slow Riot and Meath’s finest export, HamsandwicH. First up was Jack O’Rourke, ably assisted by Amy Fitzgerald on cello. O’Rourke started with the excellent ‘Naivety’ before dedicating the gorgeous ‘Silence’; a song which was written for the marriage equality referendum to 2 lucky members of the LGTB community. Next up was “Bowled Over” a song whose almost chirpy tone belies its dark lyrical content and the set was wrapped up with “Corner Boy”, another fine example of O’Rourke’s excellent use of colloquialisms and Cork landmarks in his song writing. In stark contrast to O’Rourke’s stripped back approach, the opening bars of “absent dreams” almost blew the roof off, as limerick 4 piece Slow Riot introduced themselves. The sound of piercing guitars and rumbling bass fill the room as Slow Riot make their way through a brand new number before launching into the excellent ‘Pink December’. Their influences are inheritably obvious, and the magnificent ‘Trophy Wife’, with its dark subject matter is a wonderful hat tip to their post punk predecessors. It was clear that the bulk of the crowd were here for HamsandwicH, this was evident when groans rang out when as they found out that the band were doing a last minute sound check and not beginning their set. These groans even prompted the Today FM staff to start the performance a song earlier than originally planned. The show itself was short and sweet; The highlight of which was a stunning cover of Massive Attack’s ‘Unfinished Sympathy’. The remainder of the set all came from the excellent ‘Stories From The Surface’ album in the form of ‘All Worthwhile’, ‘In Perfect Rhymes’ and the wonderful ‘Illuminate’.